WALLAROO PIER in Spencer Gulf, South Australia, where Mariehamn grain ships take their golden cargo of grain aboard. In the centre of this photograph are the Invercauld and the Mashona. These ships were built in 1891. The Mashona, a four-masted barque, had a net registered tonnage of 2,353 and was 304 feet long. Her beam was 43 ft. 2 in. and depth 24 ft. 2 in. The Invercauld and her sister ship the Inversnaid were smaller vessels with a length of 238 feet and a gross tonnage of about 1,300. The ships illustrated were the predecessors of the Mariehamn grain fleet. EVERY year, in early summer, the end of the so-called grain race is heralded by the arrival at Falmouth, Cornwall, or at Queenstown (Cobh), Ireland, of some of the fleet of square-riggers which to-day are among the last survivors of deep-water sail. A real spirit of rivalry does exist between ship and ship, and individual performances are the subject of keen discussion among the sailing fraternity, but to regard this annual sailing from Australia as a speed contest is incorrect. The participants are unequally matched in tonnage and in rig, and there is no common starting point or time. No two vessels contend with precisely similar conditions of weather, nor do they always maintain identical courses. The majority come home by Cape Horn, the old “Sailor’s Way” of the racing wool clippers, but every captain is at liberty to choose the longer and quieter alternative of a passage round the Cape of Good Hope. The choice is often decided by the prevailing conditions in the Australian Bight, and a prudent ship-master may Well convert a head wind into a fair wind by running westward round Cape Leeuwin on the south-west coast ol Australia into the Indian Ocean. Neither the Panama Canal nor the Suez Canal is of much help to the sailing ship from Australia. The canal dues are high, and the adjacent climatic areas are unsuited to the heavy-laden steel sailer of to-day, sadly lacking as she is in the ability to “ghost” along in faint tropical airs. Little or nothing is heard of the grain-ships during the long homeward passage. Except in one or two of the ships that participate, wireless plays no part in the life of this last fleet of commercial sail. Sixteen thousand miles of lonely sea lie between South Australia and England, for the sailing vessel does not use the same direct routes as the steamer, to which, by comparison, wind and weather are of little account. The wind-driven ship sails down to high latitudes south to take full benefit of the great everlasting Westerlies which will drive her eastward to Cape Horn. Few steamers, apart from whalers, ever traverse that lonely waste of water. Unless the grain ship passes by day close to the Falkland Islands, she may never be spoken until, in equatorial latitudes, she crosses the wide belt of steamer tracks that converge on the South American ports of Buenos Aires and Rio de Janeiro. MOORED TO THE PINES and to ring-bolts on the rocky shore at Mariehamn. 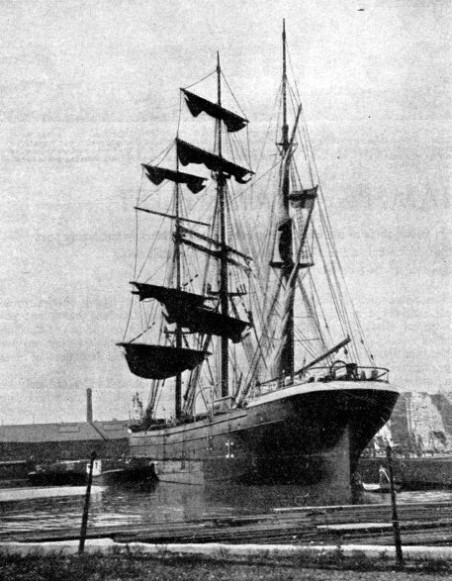 The Killoran, shown in this photograph, is a steel barque of 1,817 tons gross, and was built in 1900 by the Ailsa Shipbuilding Co., Troon, Ayrshire. She is 261 ft. 6 in. long with a beam of 39 ft. 2 in. and a moulded depth of 24 ft. 4 in. Grain is an almost imperishable cargo. It carries well and is little affected by the hundred days’ passage of the average sailing ship from Australia to Great Britain. No seasonable markets are lost by the extra weeks of transit. The free warehousing afforded by the vessel may operate in her favour. It generally happens that her cargo is sold and resold several times while she is at sea, and the margins of a rising grain market may make even the slowest sailing-vessel popular in the opinion of a speculator. This carriage of grain from Australia to Europe offers regular employment to the big sailing ship. Sail chartering is entirely in the hands of one London firm, and the cargoes go to British buyers and the ships to British ports. An occasional cargo may be sold to Continental buyers, depending on the state of their markets. The square-rigger has been ousted by steam competition from one trade after another until nowadays she often has to sail 16,000 miles in ballast every year - from one end of the earth to the other - to find the one annual cargo that justifies her existence. Captain Gustaf Erikson of Finland is largely responsible for the continued existence of the famous grain fleet of sailing ships, except for the Parma and the two Swedish vessels Abraham Rydberg and C. B. Pedersen. The two German ships Padua and Priwall, for a time in the Australian grain fleet, have now reverted to the Chilean nitrate trade. Erikson went to sea as a cabin boy at the age of ten, was successively cook, bo’sun and mate, and, when nineteen, the skipper of a little wooden Baltic sailing vessel. From 1902 to 1913 he was a master-mariner in sail. At the age of forty-one he relinquished command for ownership and settled down at Mariehamn. There his fine fleet is based, in the Aland Islands of the Baltic Sea. The shipping slump after the war of 1914-18 exercised his particular genius. He bought first-class second-hand tonnage at scrap prices when everyone else in the business was only too thankful to sell, for the ports of the world were congested with idle sail tonnage. When he had thus dispelled the spectre of depreciation by astute buying. Captain Erikson operated uninsured. An unlimited supply of young Scandinavian personnel and a large foreign quota of premium apprentices solved for Erikson what, in other countries, were insuperable difficulties. Underwriters have paid no loss on any cargo in an Erikson ship between 1918 and 1936. Of his two total losses in that period, one ship, the Hougomont, was in ballast; in the other instance, that of the Melbourne, the monetary loss was reimbursed by the colliding steamer, as the steamer had been at fault. Year by year this epic fight to keep sail upon the seas becomes more bitter. It has been estimated that in wages, food, charges and general upkeep, it costs to-day about £1 a ton to send a big square-rigger across the world and back again, even if she runs without major casualty or without any excessive loss of canvas. With grain freights at, say, twenty-five shillings a ton, her 3,000- to 5,000-tons homeward cargo would seem to leave little enough margin of profit on a year’s voyaging after provision for eventualities. At times in recent years she has had to be content with as low a freight as nineteen shillings and sixpence a ton. For many years coal, nitrate, timber, guano and such cargoes have become the perquisite of the steamer, yet sail can still obtain a grain charter. A long, shallow arm of the South Pacific Ocean penetrates 200 miles into the interior of South Australia. Spencer Gulf, as this arm is called, provides a direct outlet for the great South Australian wheat belt in conditions that are as favourable to the sailing vessel as to the steamship. FROM THE LONDON RIVER the Loch Linnhe sailed on her last voyage in 1933. She was considered too small (1,346 tons gross) for the Australian grain trade and was returning to Mariehamn in ballast. As she approached her home port on November 5, she went out of her course and was driven ashore. No lives were lost, but she broke up beyond hope of salvage. The Loch Linnhe was an iron vessel built at Glasgow in 1876. Scattered along the shores of Spencer Gulf are many small outports, consisting perhaps of a general-store, a post office, a few shacks, and a long, wooden jetty. Port Germein, Port Broughton, Port Victoria or Port Pirie are merely names that mean little to the world in general, but they mean life itself to the last of the great sailing ships at the present day. At most of these little ports the vessels load at the quayside, but at Port Victoria and at Port Broughton the cargo is loaded from lighters into the sailing ships. They lie at anchor out in the quiet roadstead a mile or two off shore, swinging at their cables in the blazing midsummer sunshine of an Australian Christmastide, the height of the golden harvest of the South. By rail, lorry or wagon team, the grain comes to the jetties from the great country farms. It is transported by local ketches and schooners to the waiting ship where the stevedores, using the ship’s own tackle, stow it, bag by bag, into the capacious holds. Before an inshore berth can be reached, the big sailer must be lightened of the ballast that she has carried all the way from Finland. Lucky are the crews of the few ships that are wholly or in part ballasted by water, for the discharge overside of 1,500 tons of stone, gravel or rubble is a long and back breaking task. The gravel has to be loaded into baskets in the stifling heat of the lower holds, and then hoisted up and swung outboard by block and tackle to be discharged. 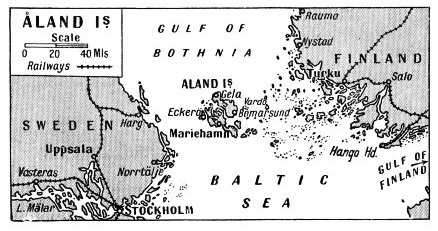 The Aland islands are situated in the Baltic Sea between Finland and Sweden. There are more than 6,009 islands in the group. Mariehamn, the home port of Erikson’s grain fleet, is the capital of the islands which form part of Finland. The high overheads, wage bills, port charges and demurrage of the steamship make rapid loading an economic essential. She must berth alongside the giant elevator or the travelling cranes of a modern port. Her golden cargo must pour in through several hatches simultaneously. The one month or occasionally more spent in the primitive loading of the sailing ship in the Spencer Gulf would spell ruin to the steamer. Many years ago the barren coast of South Australia which borders the Great Bight received from the seamen-cartographers of the time a nomenclature suggestive of the perils of the sea. False Bay, Coffin Bay, Cape Catastrophe and Anxious Bay are typical names shown on the chart of the approaches to the deeply indented Spencer Gulf. One day, in May 1932, a 3,000-tons steel four-master, Erikson’s Hougomont, limped wearily past Cape Borda into the shelter of the Gulf. She presented an extraordinary spectacle, for of all her proud and lofty top-hamper of masts and yards only three short, jagged stumps of lower-masts remained. Seventeen days earlier, when nearly at the end of her long outward ballast voyage from Europe, she had been caught in one of the fierce and sudden gales that have earned for the Australian Bight its unenviable reputation among seamen. When the gale had abated and the dangerous confusion of fallen spars and gear had been cut away, the Hougomont looked a sorry derelict For more than 500 miles she crawled under jury rig, a pitiful travesty of her former beauty, until she made what was to be her last landfall. She fell in with a solitary steamer during the passage and received an immediate offer of towage. This was refused by the signal: “All well, no assistance required”. A FOUR-MASTED BARQUE bound for her home port, the Lawhill crosses the North Sea after she has discharged her cargo of Australian wheat at a British port. This photograph was taken in August 1935 from the Cunard White Star liner Doric, 16,484 tons gross. The Lawhill, 2,816 tons gross, was built at Dundee in 1892. She has a length of 317 ft. 5 in., a beam of 45 feet and a depth of 25 ft. 2 in. It was a remarkable piece of seamanship, rarely matched in these days of steam and wireless. A dismasted, uninsured sailing ship to-day is the equivalent of a total loss, for it would cost more than her entire market value to re-rig her and fit her out for sea again. The Hougomont was far too severely damaged to warrant any reconditioning, and, stripped of every useful fitting, the hulk was shortly afterwards sunk off Stenhouse Bay Jetty, almost at the extreme end of the Yorke Peninsula at the mouth of the Spencer Gulf, to form a breakwater for the new jetty. Even towards the close of the nineteenth century the great seaports of the world always presented the lovely pageant of a great company of tall ships berthed together. Circular Quay at Sydney, the San Francisco waterside, the docks of Liverpool, the roadsteads of Chile, London River - all were forested by splendid iron or steel square-riggers. The great deeds of the wooden and composite extreme clipper ships were even then a thing of the past; but sail was still a power to be reckoned with in maritime transport. The fortunes of modern deep-water sail are inevitably linked with the rock-bound lagoon of the harbour of Mariehamn, the capital of the Aland Islands. Thirty or forty years ago Spencer Gulf was a well-recognized venue of the sailing ship, and at certain times its ports and roadsteads were well filled, by British vessels. The small port of Mariehamn, on the other hand, has become known to the outside world only in recent years. Aland is a sea-girt territory of over 6,000 islands, many of them mere rock islets, situated at the entrance to the Gulf of Bothnia in the Northern Baltic. The largest island, Aland itself, is eighteen miles long. Originally part of Sweden, it was captured in 1809 by the Russians, and was ceded to the Tsar by a subsequent treaty. In 1854 Great Britain was at war with Russia, and Admiral Napier sacked and burnt Bomarsund, the ancient fortified capital of Aland. This resulted in the establishment of Maarianhamina as the new capital. This town is generally referred to by its Swedish name, Mariehamn. When, in 1917, after the Russian Revolution, Finland became an independent republic, both she and Sweden laid claim to Aland. A referendum proved favourable to a Swedish union, for in language, manners and customs the islanders were far more Swedish than Finnish. Sweden, however, relinquished her claim, and by its first settlement of a major territorial dispute, the League of Nations in 1921 gave Aland to Finland. There are Viking graves at Godby in Aland, and the Viking blood would still seem to flow in Aland veins. The situation of the islands attracts men to the service of the sea. Few communities to-day are more dependent upon the sea for their livelihood than these 27,000 islanders, among whom are the finest natural seamen in the world. THE ALAND ISLANDS of the Baltic Sea afford shelter for ships of the Mariehamn grain fleet, which may often be seen at anchor or moored there. This photograph, taken in 1934, shows the steel four-masted barque Passat, with the Penang in the distance on the right. The Passat was built at Hamburg in 1911. She is 323 ft. 6 in. long, 46 ft. 10 in. in beam, and 26 feet in depth. To-day Aland-built wooden sailing vessels still carry timber, fish and dairy produce about the Baltic, as has been done for hundreds of years. Such vessels wore built and managed by groups of Aland landowners. Gradually these local ventures prospered and extended until Aland vessels were voyaging farther afield. 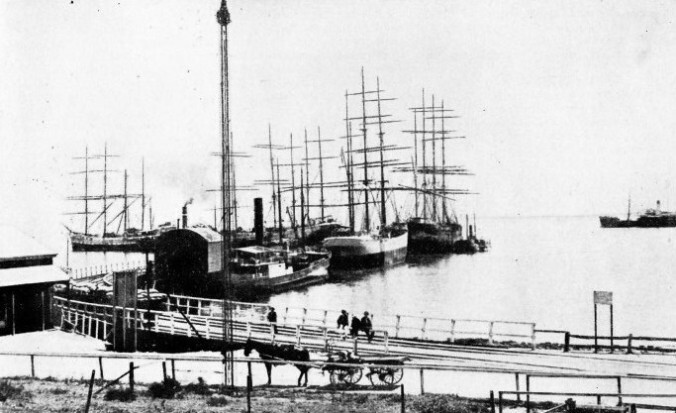 By the end of the nineteenth century Aland shipowners were investing in second-hand foreign tonnage, big wooden American schooners and iron or steel European full-riggers and barques. Vessels flying the Russian flag, and with the unfamiliar name of Maarianhamina across their shapely counters, were now occasionally to be seen in ports and harbours as far away as San Francisco, Valparaiso or Melbourne. Mariehamn Harbour is most spacious, and resembles the shape of an hour-glass. The circular outer basin, some miles in circumference, is dotted with wooded islets, and is connected to a longer but narrower inner lagoon by a deep-water passage between pine-clad and rocky promontories typical of Aland scenery. In the height of summer, Mariehamn is a wonderful sight, with its golden sand, clear, deep water and a multitude of small sailing craft of every design and rig. There are little white passenger steamers from Stockholm and Helsinki (Helsingfors), and half a score of big, old-fashioned wind-ships moored to the pines or swinging idly at the buoys, their graceful height accentuated by perfect reflection in the mirror of the sea. It happens but rarely that the whole of Erikson’s fleet reaches Mariehamn in any one autumn. One or two vessels may have been fortunate enough to sail again at once for South Africa or Australia with one of the few cargoes of timber now on offer from Sweden or Finland. An occasional vessel still gets a cargo of guano from one of the Seychelles Islands to New Zealand. Others too tardy in their arrival in England may sail straight out to Australia again after they have discharged their grain, and for two years not see home. In early September the rest will leave the Baltic outward bound. There are few roads, and fewer motorcars in this northern archipelago. Here are farms in which every field is a separate islet. There are a school for sea-cooks, windmills by the hundred, a collection of figureheads of famous bygone ships and a private museum of twentieth-century sail, including models, paintings and photographs. Mariehamn is the only port in the world where are to be obtained at once the entire crew, from skipper to boy, for a big sailing vessel. The few pilots of Mariehamn, all themselves ex-captains of deep-water sail, have little use for tugs. In their opinion a wind-driven ship should be sailed to her berth. It is a wonderful sight to see one of these big ships standing in through the narrow, rock-bound entrance to the outer harbour under a great spread of sail. It is no mean feat of seamanship, and is fraught, at times, with much hazard. 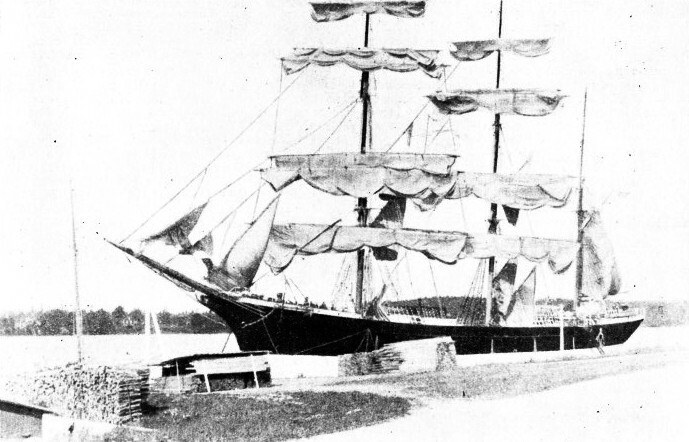 AFTER THE VOYAGE FROM AUSTRALIA the Penang dries her sails at Mariehamn. The photograph above shows the Penang from a more distant position. She is a steel barque of 2,019 tons gross. Built at Bremerhaven in 1905, she is 265 ft. 8 in. long, with a beam of 40 ft. 3 in. and a depth of 24 ft. 4 in. About half-past eight on a blusterous August evening in 1933, the barque Penang clewed up her mainsail, royals and spanker, and backed her foremast yards, to let the pilot come aboard. She was then about two miles off the entrance, and the top-hamper of two other grain ships could be seen above the trees inside the outer harbour. Some way had been lost, but the wind was strong and fair, only a point or two off the starboard quarter, and, with the resetting of full canvas, the Penang soon forged ahead for the narrow entrance at a good eight to ten knots. Suddenly, with all the fickleness of a doldrums squall, the wind veered round to the north of east and, strengthened to half a gale, accompanied by such blinding rain that all trace of land was blotted out. The pilot roared out the order to put the ship about, the mate’s whistle shrilled out its triple call for “All hands on deck”, an extra man was sent to the lee wheel, and within a few minutes the Penang was sweeping round in a wide arc. In due course she stood out again to the safety of the open sea. The next few dismal hours were spent tacking backward and forward away to the south of Mariehamn. There was a heavy, lowering night sky, with driving rain and a strong north-easter blowing. The ship scudded along at anything up to ten knots, laying over to leeward about fifteen degrees. Ever and anon the whistle’s call would bring out a handful of figures in oilskins to man the brace and halliard winches, or to scramble aloft up the ratlines of the lower shrouds, and on to the jerking foot-ropes of the swaying yards. In the early morning the wind suddenly shifted to the south-east, and the Penang raced northward for the entrance to the harbour. The ship just cleared the rocks to starboard and swam majestically down the moon path on the calm surface of the huge lagoon. So close in did she sail that night that next morning she was warped to the quay by hawsers at bow and stem, led to her own capstans. Registered at the little port of Mariehamn and owned by Captain Erikson are some of the biggest sailing ships in the world. 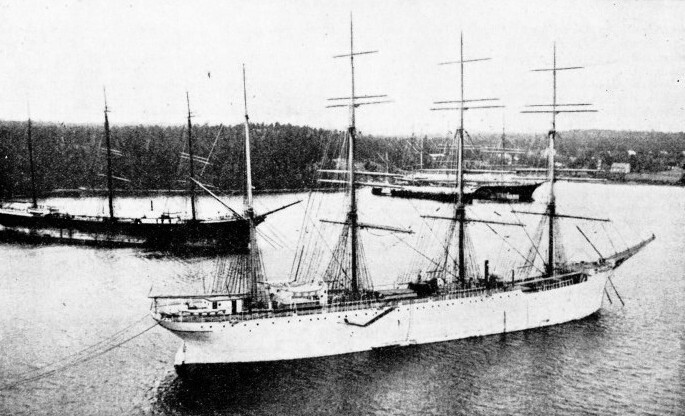 The Penang, 2,019 tons gross, was built at Bremerhaven in 1905. Her length is 265 ft. 8 in., her beam 40 ft. 3 in. and her depth 24 ft. 4 in. The steel four-masted barques Pamir, 2,799 tons gross, and Passat, 3,137 tons gross, were bought by Captain Erikson from their German owners. The larger vessel, the Passat, is 323 ft. 6 in. long, with a beam of 46 ft. 10 in. The Pamir has a length of 316 feet and a beam of 46 feet. Slightly larger than the Pamir is the Lawhill, 2,816 tons gross. She was built at Dundee, Scotland, in 1892. Her length is 317 ft. 5 in., her beam 45 feet and her depth 25 feet. The Grace Harwar was also built in Scotland, but three years earlier and at Port Glasgow. She had a gross tonnage of 1,816, a length of 266 ft. 8 in. and a beam of 39 feet. She was broken up at Charlestown, Fifeshire, in the summer of 1935. One of the later additions to Erikson’s fleet is the L’Avenir, 2,776 tons gross. She was built in 1908 at Bremerhaven. She has a length of 278 ft. 3 in. The gross tonnage of the Viking, another of Erikson’s fleet, is 2,670, but her length is 293 ft. 10 in. She has a beam of 45 ft. 11 in. and a depth of 23 ft. 10 in. 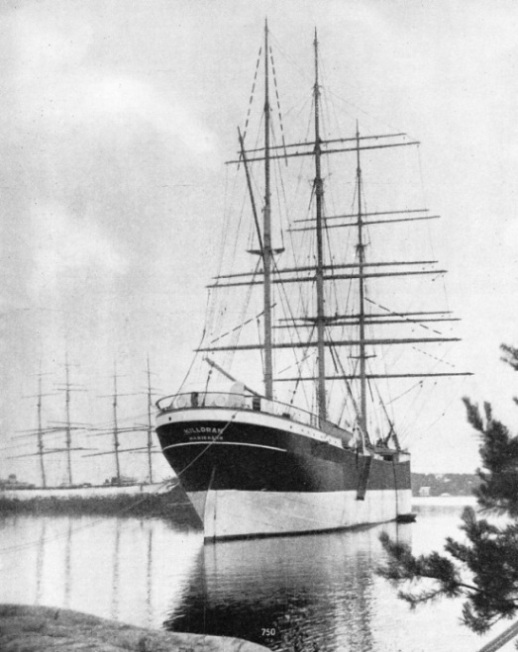 In 1935, the steel four-masted barque Moshulu, 3,116 tons, was added to the Mariehamn fleet. She was built at Port Glasgow in 1904. She is 335 ft. 4 in. long, with a beam of 46 ft. 10 in. and a depth of 26 ft. 7 in. She carries more than 4,800 tons of wheat. 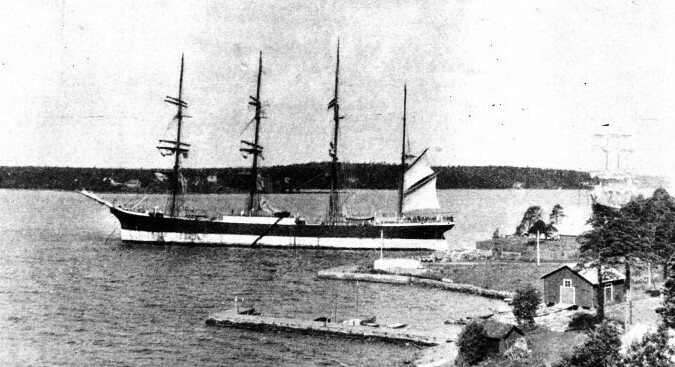 The pride of Erikson’s grain fleet was the famous Herzogin Cecilie. Her history is told in the chapter beginning on page 127. She was one of the largest sailing ships afloat, with a gross tonnage of 3,111. Her mainmast was nearly 200 feet high and she set 46,000 square feet of sail area. Built at Bremerhaven in 1902, she had an overall length of 335 feet and a beam of 46 feet. In April 1936 this great ship went ashore in a dense fog between Salcombe and Hope Cove, in Devonshire. SUMMER IN MARIEHAMN HARBOUR sees many of Erikson’s grain fleet at home between their annual voyages to Australia for wheat. This photograph, taken in August 1935, shows in the foreground the steel four-masted barque L'Avenir, 2,776 tons gross. On the left is the barque Winterhude 1,972 tons gross; in the right background are moored the little barque Pestalozzi, 1,047 tons gross, and the three-masted barque Penang. The Pestalozzi does not voyage to Australia, but carries timber to British ports. Click here to view the photogravure supplement to this article. You can read more on “The Herzogin Cecilie”, “In the Sailing Ship’s Forecastle” and “Speed Under Sail” on this website.